Brian O'Keefe has been serious about fly fishing for the past 30 years. During the past 20, cameras have played a significant part in his outdoor lifestyle. Brian O'Keefe has traveled to some of the wildest and most remote angling destinations in the world, including: Bikini Atoll, the Seychelles, Kenya, Sierra Leone, Tonga, Cuba and Kashmir. He has also traveled to more accessible locations, such as: the Bahamas, Belize, Costa Rica, Nicaragua, Venezuela, Chile, New Zealand, Christmas Island and more. He's fished for Bonefish just about everywhere so join us and learn how to fish for these incredibly fast flats fish. Baby tarpon are not as small as you might think - 10, 20 or 30 pound fish are always a blast on a fly rod. Join Brian O'Keefe as he shares his expertise in hunting down baby tarpon on the flats of Campeche, Mexico. At age eight, Brian’s interest in fly fishing was born while spending summers in Montana with his grandparents. There he was taught the art of fly casting and fishing by his grandfather, a dry fly purist. From those first years fishing the waters of the Northwest and Montana, he has spent the majority of his free time fishing and taking advantage of all the outdoors has to offer. On family vacations, Brian would often go off alone to fish a nearby stream. His interest in photography began as a means to back up with pictures, what his family thought might be just "tall tales". 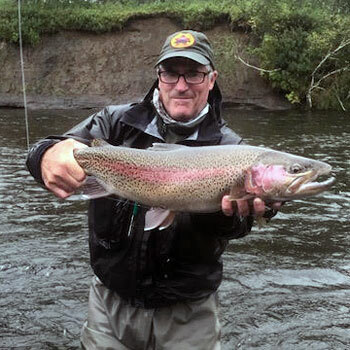 Brian lives with his wife and fishing partner, Judith in Powell Butte, Oregon and continues to work as an angling and outdoor photographer, having had photographs published in periodicals such as: the Los Angeles Times; the New York Times; the Miami Herald; USA Today and many others. He has had cover shots in: Field & Stream; Outdoor Life; Fly Fisherman; Fly, Rod and Reel; Fly Fishing Salt Waters; Fly and Fish Magazine; Outside Magazine and Mens Journal. In addition to photography, Brian works as a tackle rep for Scientific Anglers in Washington, Oregon and Alaska. Today, you could just as easily run into Brian on his way to a slide show presentation at your local fly fishing club, as you could in an airport on his way to some island in the Pacific. For more information on Brian's incredible photographs and slide show presentations visit his web site at www.brianokeefephotos.com.